A Really Awesome Mess was a great read! It was heartfelt, funny, and full of honest observations about life. The characters were the best part of this book. They were well-developed, realistic, and diverse. I love reading about all different types of people, and I really love reading about people with all different types of problems. And this book had that in spades: the setting is a reform school. Each character was at Heartland Academy for a different reason, and their own individual issues made for an interesting read. I loved seeing the characters work through their issues in healthy ways. I hate "love cures all" types of books, so to see people grow and change through hard work, therapy, and shifting their mindsets was really encouraging to read about. You might think that a character-driven book like this one would be a slower read, but it wasn't. The conflict resolution in each character's life provided enough intensity that the story moved at a great pace. The ending was perfect, I couldn't have asked for a more appropriate and satisfying end to the book. 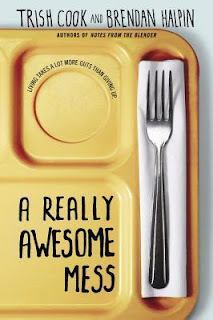 A Really Awesome Mess was a great, fulfilling read that made me feel good while reading it. It made me smile, and tear up a few times, and overall I had a great time reading it. The writing style was very open and easy to read. The voices were fresh and honest---two of my favorite things. I would recommend this book to anyone! Great review. I really like this cover for some reason.